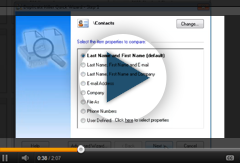 So far it is the best tool for keeping my Contacts duplicate-free! I'm using it for almost a year now and planning to use it in a future. Great tool! Andrew was timely, helpful and polite. Thank you. I liked the Sync2, very easy to use, except for the duplicates in calendar/contacts. I hope the Duplicate Killer will resolve that. Great App. I cleaned all my duplicates. It did the trick for me to clean up a big mess of duplicate contacts. And I can keep them clean.